What is Dividing? Find out here! 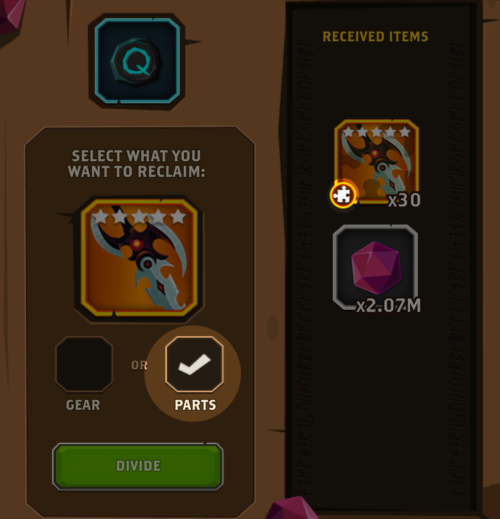 Dividing allows you to retrieve some of your Eternium spent from upgrading gear. You can also get back some Reforge Powder used in reforging gear. Dividing unlocks at Hero Level 9. When you Divide a Gear, the Gear will be reset to level 1. Dividing Gear requires Divide Tokens. There are two types of Divide Tokens: Lesser Divide Tokens and Superior Divide Tokens. Lesser Divide Tokens are brown, while the Superior variant has a blue color. 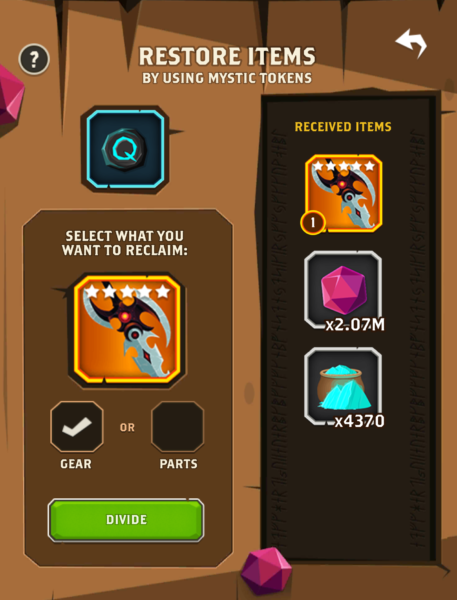 Lesser Divide Token – Retrieves 80% of the currency/materials used in upgrading. Superior Divide token – Retrieves 95% of the currency/materials used in upgrading. 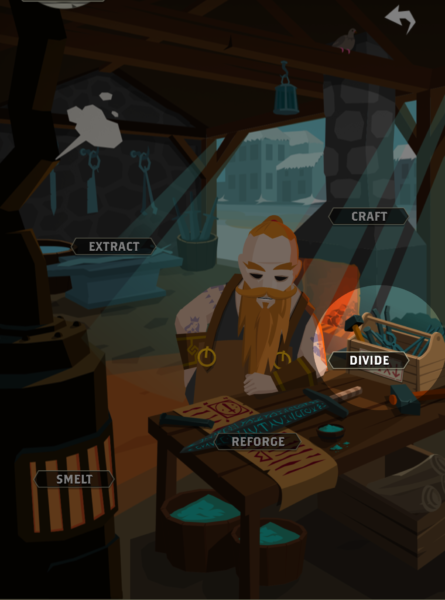 You can get to the Divide menu by going to Home > City > Forge > Divide. 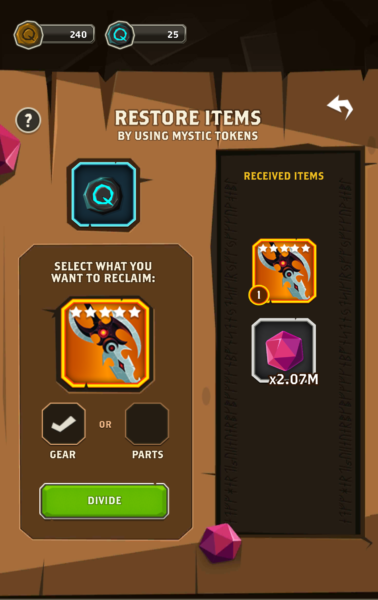 You will get back the item itself or the number of parts required to combine the Gear back together depending on what you want. If the item was Boosted, parts used to Boost it are also retrieved in the dividing process. An example of getting back some Reforge Powder when Dividing. 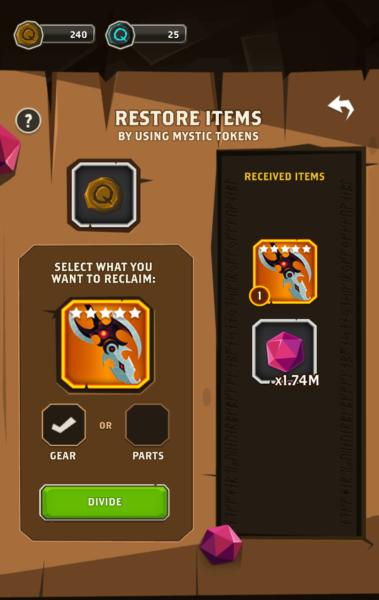 Dividing the same item with a Superior Token yields 2.07M Eternium versus 1.74M Eternium with a Lesser Token. Your total token count is displayed on the top left of the screen. Hello! Where would be the best place to farm (grind) for Lesser Divide Tokens? How about for Superior Divide Tokens?